Change happens, and you’ll want to change your iPod schedule or even add new events as you learn about them. You can enter events on your computer and sync them with your iPod classic or iPod touch. You can also enter and change events directly in your iPod touch and keep changes and additions synced with your computer and with other devices using iCloud. Tap the add (+) button in the upper-right corner of the Calendar screen. The Add Event screen appears. Tap the Title/Location button and enter the event’s title and location using the onscreen keyboard. Tap Done in the upper-right corner to save the entry (or Cancel in the upper-left corner to cancel the entry). Tap the Starts/Ends/Time Zone button to enter the starting and ending times and dates and time zone. The Start & End screen appears with a slot-machine-style number wheel to select the date and time, and an option to change the time zone for the event. 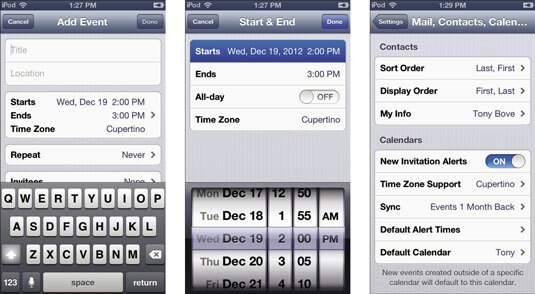 Tap the Starts button and select the date and time, or tap the Off switch for All-Day to turn on the All-Day option. Slide your finger up and down the slot-machine-style number wheel to select the date and time. If you turn on the All-Day option, the number wheel changes to show only dates; select a date for the all-day event and skip the next step. Tap the Ends button and select the date and time as you did in Step 6. The Add Event screen appears again, and you can scroll the screen to see more options. (Optional) Set the event to repeat by tapping Repeat and selecting a repeat frequency; tap Done (or Cancel). You can set the event to repeat every day, every week, every two weeks, every month, or every year (or none, to not repeat). (Optional) Invite others to the event by tapping Invitees, entering or choosing a contact’s e-mail address, and tapping Done (or Cancel). You can send an invitation by e-mail to any contact by tapping the plus (+) icon and choosing the contact. You can also enter an e-mail address in the To field. (Optional) Set an alert for a time before the event by tapping Alert and choosing an alert time; tap Done (or Cancel). You can set the alert to occur from five minutes to two days before the event. You can also set a second alert time in case you miss the first one or need two alerts. (Optional) If you have multiple calendars synced with your iPod touch, you can change the calendar for the event by tapping Calendar and choosing a calendar. The Calendars screen appears with a list of your calendars. Tap a calendar’s name to choose it. After you tap Done (or Cancel), the Add Event screen appears again. (Optional) Tap Availability and choose Busy or Free. The Calendars screen shows whether you are busy or free for this event. (Optional) Add a URL for the event by tapping URL and using the onscreen keyboard to type the URL. The URL field appears along with the keyboard for typing the web page URL (web address). Tap Done or Cancel to return to the Add Event screen. (Optional) Enter notes about the event by tapping Notes and using the onscreen keyboard to type notes. The Notes field appears along with the keyboard for typing your notes. Tap Done (or Cancel). Tap Done in the upper-right corner of the Add Event screen to save the event (or Cancel in the upper-left corner to cancel the event). The new event now appears in your calendar in the lower portion of the calendar view when you select the day. You can edit the events you created, but not the events that appear in your Facebook Events calendar. To edit an event, tap the event in the lower portion of the calendar view, and then tap Edit in the upper-right corner of the Event Details screen. The Edit screen appears with event information ready for editing. To edit the event information, follow Steps 3–16. To delete the event, scroll the Edit screen all the way to the bottom to see the Delete Event button (which appears only when you’re editing an event). After you tap Delete Event, a warning appears to confirm the deletion — tap Delete Event again or tap Cancel. The calendar view appears again.